What is AcroYoga? Acroyoga is a fusion of acrobatics, yoga, and thai massage. It is a movement practice that is performed in pairs or groups and creates trust, self-confidence, and lots of laughter. It will help you build strength, flexibility, body awareness, and even communication skills. 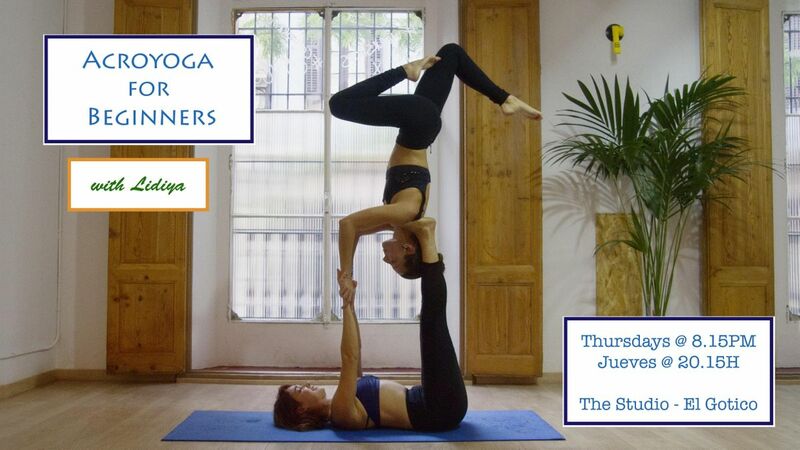 This class will focus on foundations of Acroyoga with the goal to help you learn the proper technique and practice in a safe and supportive environment. Side effects include happiness, elevated mood, and desire to hug people ;-) I will provide easier variations for first-timers and more challenging variations for those with more experience. The class will be concluded with some massage. Join me every Thursday at 8.15pm at The Studio! 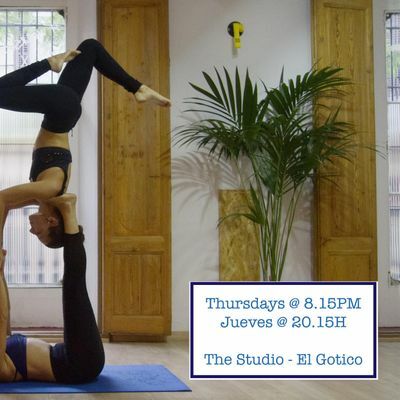 - No previous Acroyoga or Yoga experience is required.- No partner is necessary as you will work in groups of three or more.- Instruction will be in English, but I also speak Russian and some Spanish.- Please bring a towel, water, and some warm clothes to wear during massage at the end. [[Price]] Trial class: 10€Individual class: 12€4 Class Pack: 40€We will not turn anyone away for lack of money, please come talk to us or write us if you are in a financially difficult situation. [[Location]] The Studio by Jamie Luke Health & FitnessPassatge de la Pau, 10, 08002 Barcelona[[Inscriptions]] Maximum 21 people. Reserve your spot by texting Lidiya on Whatsapp @ +1 412 977 3170 or through FB Messenger. [[Payment]] Paypal bGlkaXlhYmVyIHwgZ21haWwgISBjb20= or cash during class. [[About Lidiya]] I discovered AcroYoga in 2012 while I was in my thirties living in the United States, near San Francisco. I fell in love with it from the first flight! For me AcroYoga contains so many aspects of what I want in my life – trust, connection, movement, laughter, and a supportive community. Four years later in 2016 I quit my job as a software developer, completed a month-long teacher training, and embarked on a journey to share my passion with others. I did not have any gymnastics, acrobatics, or yoga experience before I started practicing AcroYoga, so I very well understand the challenges many adults encounter. Besides the obvious health benefits, this practice has also helped me to improve my communication style, self-esteem, and the way I face challenges. My goal is to help other people find the same happiness and self-empowerment that I have experienced in this practice.